Beginning with the March 30 issue, Colorado Politics magazine will include a new, multi-page “Focus on Denver” section covering Denver politics and policy. As part of our expanded coverage veteran Denver editor Neil Westergaard will contribute a regular column on the city. Colorado Politics has also hired John C. Ensslin to cover Denver politics, government and civic affairs. 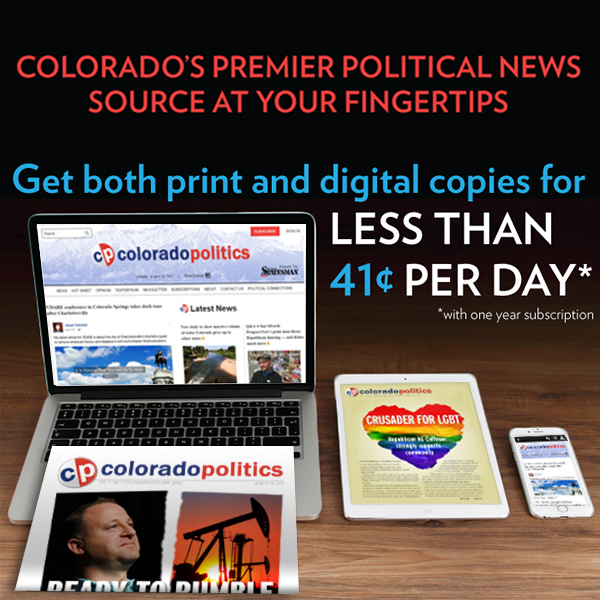 In addition to our new Denver section on ColoradoPolitics.com we will also be featuring Denver news in our e-newsletters twice each weekday. The Denver skyline at sunsent. Colorado Springs lost bragging rights to Denver as the two cities traded places in this year’s ”Best Places to Live” ranking by U.S. News & World Report magazine. In 2018, Colorado Springs finished second, just ahead of Denver, the first time it ranked higher than Denver since the magazine began compiling the list in 2016. Denver ranked second in this year’s list, though, just ahead of the Springs. Both fell behind Austin, Texas, for the third consecutive year. Colorado Springs Mayor John Suthers said he gave Denver Mayor Michael Hancock “a hard time” about besting Denver last year, and Hancock told him “to be more diplomatic.” So Suthers congratulated Denver “for finishing second” this year, but he noted that the Springs is gaining residents from the Denver area because of more affordable housing prices. Suthers said he was pleased “to be in the top three” and pledged that the Springs would pass Denver and Austin “one of these years” to finish atop the annual list. U.S. News and World Report ranked Colorado Springs last year as the nation’s “most desirable place to live,” he noted, a rank he hopes the city will repeat when that list is released in July. The newly re-elected Suthers said he hadn’t heard from Hancock by Monday afternoon, but his Denver counterpart is the midst of a re-election campaign of his own. Denver moved ahead of the Springs on the best places to live list, mostly due to slightly higher migration numbers and a hotter job market with a lower unemployment rate and higher median annual salary, ranking as the eighth-best job market. The Springs ranked 43rd among the 125 cities on the list, said Devon Thorsby, real estate editor for U.S. News & World Report. Before finishing second last year, Colorado Springs ranked 11th in 2017 and sixth in 2016, while Denver finished second in 2017 and first in 2016. The rest of the top 10 in this year’s list, from fourth to 10th place, are: Fayetteville, Ark. ; Des Moines, Iowa; Minneapolis-St. Paul; San Francisco; Portland, Ore.; Seattle; and Raleigh and Durham, N.C. At the bottom, placing No. 125, was San Juan, Puerto Rico. No other Colorado cities were on the 2019 list. The magazine’s rankings are based on affordability, job prospects and quality of life, using data from the U.S. Census Bureau, the FBI, the U.S. Bureau of Labor Statistics and U.S. News & World Report’s own rankings on best high schools and hospitals. Quality of life is the most heavily weighted factor at 30 percent, followed by affordability at 25 percent.